The default way in which solutions are prepared using my hydroponic nutrient calculator involves the direct addition of some component in your nutrient reservoir plus the preparation of some micro nutrient and iron concentrated solutions from which 10 and 100mL are added per batch. This way of preparing solutions is especifically suitable for people with large reservoirs and commercial hydroponic growers since when reservoir levels go above 4 cubic meters all nutrients can be added directly to the reservoir, saving the time and cost of preparating any concentrated solutions. The approach is also good for people with small reservoirs since you can prepare the micro and iron concentrated solutions, dissolve other salts directly and in the end you will have a very accurate amount of micro and macro nutrients prepared with your own custom formulation. However upon the request of several people I implemented an approach that allows people to prepare traditional formulations using an A+B concentrated nutrient solution approach in which two concentrated solutions at a 1:100 ratio are prepared and then simply diluted to prepare the final hydroponic reservoir's contents. On today's post I will discuss this approach and how you can use it if you have the appropiate nutrient salts. Please download my hydroponic nutrient calculator here to follow this tutorial. Before we go into the main aspects of the preparation of concentrated solutions we must first understand the incompatibilities that are present within concentrated solutions that restrict the salts that can be used. The program checks for these incompatibilities automatically when using any of the saved salts and for this reason custom salts cannot be used for the A and B custom preparation. 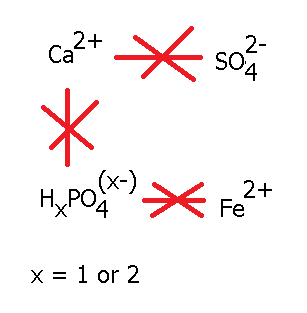 The main incompatibilities are shown on the image below. Mainly what we want to ensure is that certain ion pairs that would precipitate insoluble salts are never present together. For this we should avoid putting calcium and sulfate ions together as well as calcium and phosphate species and iron and phosphate species. 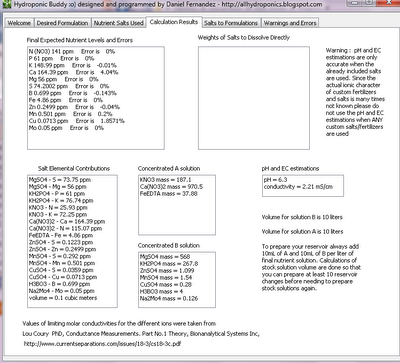 What we have left is the layout shown below that describes the general distribution of ions relevant to solubility of an A and B hydroponics formulation makeup. As you see what we achieve by dividing the concentrated solution into two is to keep away the ions that would precipiate when put together. This of course also restricts our ability to use iron sulfate and a different source of iron, either a chelate (FeEDTA, FeDPTA, etc) or iron nitrate must be used. It also restricts our sources of Calcium to calcium nitrate and therefore our sources of phosphate and sulfate are reduced to potassium salts. Now let us use our basil_soluble.txt example to calculate the composition of the given A and B solutions needed for this formulation. Unzip the calculator and txt files to any given directory and input basil_soluble.txt under the field next to the "add external" button in the "Desired Formulations" tab, then click the "add external" and "Load Formulations" buttons and select the basil_soluble.txt formulation from the drop down menu. The end result of this process is shown on the image below. 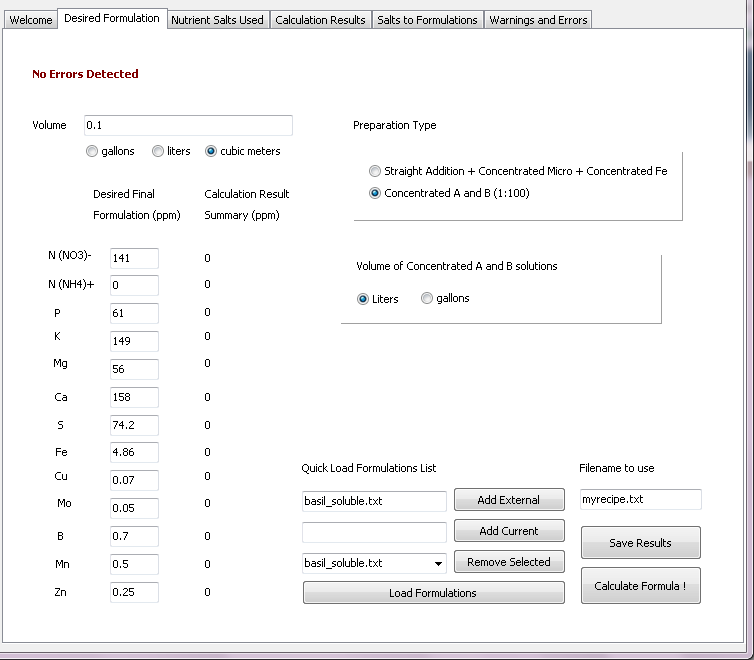 Also make sure you check the "Concentrated A and B" option so that the program calculates the results for these solutions instead of the regular method. After doing this go to the "Nutrient Salts Used" tab and uncheck Calcium Monobasic Phosphate and Iron Sulfate and check Iron EDTA, Potassium Sulfate and Potassium Monobasic Phosphate. Now go back to the "Desired Formulations" tab and click the "Calculate Formula!" button. 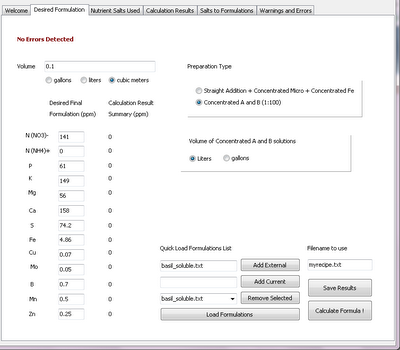 The program will now calculate the volume of A and B solutions you should prepare so that it will last for 10 reservoir changes of the volume you have input under the "Desired Formulations" tab. So for this case in which we left the input as 100L the final concentrated solution volume is 10L since it will last for 10 changes of the 100L nutrient reservoir, adding 1L per reservoir change. It should also be clear that the concentration ratio of 1:100 cannot be increased due to solubility limitations of salts. The results of the calculation are shown below. I've been using General hydroponics Flora Bloom and Flora Micro. Here on amazon.com: http://tinyurl.com/a9g4g6z http://tinyurl.com/c6xkynh Is this the approach I would use to create my own version of these? I'd like my formula to be as close as possible, will the Generic Bloom formula from the dropdown menu of your program work to emulate these or will it need tweaking? Please forgive my ignorance, What confuses me most is this statement: "I implemented an approach that allows people to prepare traditional formulations using an A+B concentrated nutrient solution approach in which two concentrated solutions at a 1:100 ratio are prepared and then simply diluted to prepare the final hydroponic reservoir’s contents." Does this mean this approach creates something similar to the FloraBloom and Floramicro above or is further dilution required before it goes into the actual tank? Thanks for the awesome program and website Daniel!!! i want to know how to create nutrient A and B for hydroponic? is there any book about it? or about hydroponic?